At Singhal Gems, we understand that the final quality of a gem depends on its cutting. 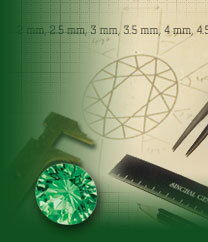 We have in-depth knowledge of facet-cuts and also great passion for precision. Each facet is methodically cut to give every gem its best possible sparkle. With fully integrated operations, we are not only able to control quality at all stages of cutting & polishing but we also provide much better value for your money.